James McArdle in "Angels in America"
James McArdle has been gradually hitting the big-time ever since the he co-starred first on the West End in Chariots of Fire, then at the National Theatre in both The James Plays and last year’s Chekhov trilogy, and now as Louis Ironson in Tony Kushner’s two-part epic Angels in America, playing in repertory in the Lyttelton auditorium through August 19. 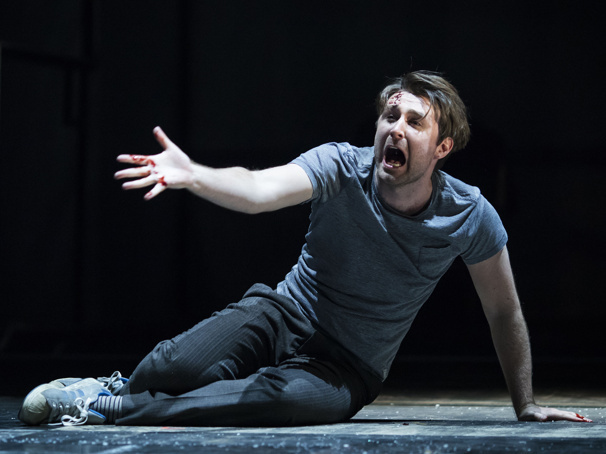 Angels in America will be broadcast in cinemas around the world including the U.S. via NT Live; part one on July 20, part two on July 27. Broadway.com caught the always-engaging Scotsman just a few days after opening night as he was on a brief, much-deserved break from the theatrical event of the London year so far. How does it feel now that you and the company—which includes Andrew Garfield and Nathan Lane—have got through a challenging but much-lauded opening week? This play’s been in my life now for over a year and a half and has been accompanied so much of that time by so much noise that the real effort has been to keep the noise out of the room so that we can do our work. So, by the time we got to Saturday, I think we let out a big breath realizing now that we can get on with it and actually do the job. Does this feel like the ultimate collective effort, from your director, Marianne Elliott, all the way down the line? Everyone’s commitment to making this work has been unbelievable and very moving: I’ve never seen anything like it. I’ve been in companies before where some people are very jaded and others are very passionate but that’s not the case with Angels. Everyone is here to do this play, which clearly means so much to everyone. Were you aware of the play already? Have you been surprised by the intensity of the audience response? I’ve been in these marathons before, like The James Plays or the Platonov and Ivanov that I was in last year, but those were both big productions with big casts whereas Angels essentially has a cast of eight, so to be with these people doing these intense scenes—and then to get that level of response from an audience—can be quite emotional. It’s such hard stuff to get through yourself that you can’t quite believe how deeply it has reached the audience. Were you daunted by the prospect of playing Louis, the character who runs from his AIDS-infected lover Prior (Garfield)? Well, I think I made a choice for it not to daunt me. I’m not sort of typical casting for Louis in many regards, and people would say to me, “Oh, you’re not this, you’re not that,” and I was like, “OK, OK, whatever.” I’m playing a character so far away from myself and with such complicated trains of thought to try to be on top of, and then to contend with knowing that Tony [Kushner] would be there was something else, as well. Did meeting Tony Kushner help you find the character? Once I met Tony, I said, “Dear God, you are Louis!” Just watching him was invaluable. To hear his speech patterns and how he wrestles with his thoughts, you actually realize that those ellipses and dashes are clearly in his actual speech and that instead of slowing him down, they propel him into his next thought. He has to stop talking or he would explode if he didn’t. Did he proffer advice or any specifics? Not advice as such, but Tony was invaluable to have, especially when you’re working on a masterpiece like this. Most of the big masterpieces we do as actors involve authors who are dead so you’re on your own, so to have Tony there and to be able to ask a question made all the difference—and then 10 pages later, you get the answer [laughs]. How do you view Louis’s relationship with Prior? I always refer to Prior as Louis’ goddess, and I cannot watch my goddess die; my heart will break so much. People are quick to talk about Louis and his actions as just being bad, with Prior as the noble one dying of AIDS and his reaction to it is so courageous. We all like to think we’re like Prior, but I think actually we’re a bit of Louis, as well. [The disease] is like a lightning bolt that could strike anyone at any time, and Louis wonders when the lightning will hit him. What is the dynamic like within the company? What’s interesting is that everyone is at different stages for themselves that are quite important to their careers: I’m the newest right through to Nathan Lane, who is a legend. This could be like being in a ‘90s pop group where everyone wants solo careers, but it isn’t, and a lot of that is to do with Marianne creating that communal atmosphere in the [rehearsal] room straight away and having a bunch of people quite quickly become very aware that the play transcends us all. Once you start wrestling with it, there’s no time for ego. Has it been exciting working with Nathan Lane? I remember at the read through crying at what Nathan has brought to the part: he’s so charismatic and funny and willing to go to such depths as well. There aren’t many actors on this planet who can make you mourn the death of [venomous lawyer] Roy Cohn, but it’s unbelievable the empathy he creates: he’s the real heart of the play for me insofar as Nathan has humanized the character in a way you could never imagine. I said to him in rehearsals, "Only you could make the audience not want Roy Cohn to die." I don’t think Nathan will ever know how much he has got me through this. There were about two or three times when I was at breaking point when he would just say the simplest thing, and it was so kind of him to do that. If I’m the baby of the company, he’s the daddy. What about that rather striking moment where Russell Tovey, playing the closeted Mormon Joe Pitt, turns his back on the audience and bares all in your direction? I’m the envy of many on the South Bank [where the National is situated]. I can see what they can’t.